Read these FAQs if you have questions about verifications and approvals on Base Camp. Can I change my home club after I submit a level completion request? As a best practice, it is not recommended that you change your home club while you have a pending request. Doing so may make it difficult for you and your Base Camp managers to determine who is responsible for approving the request. You will receive an email after your home club VPE or other Base Camp manager approves your level completion request. When you are sure your request has been approved, you may change you home club from the Pathways Start page. I am a member of more than one club. Who is my Base Camp manager? If you are a member of more than one club, the vice president education (VPE) of your home club is your Base Camp manager. If you are not sure which is your home club, this information can be found on the Pathways Start page. If you would like to change your home club, you can do so on the Pathways Start page. I am a member of more than one club. Will the club that verified my education on Base Camp get Distinguished Club Program (DCP) credit for my accomplishment? When you submit a level completion request on Base Camp, the request will be sent to the Base Camp manager of your home club for approval. However, this does not mean your home club automatically receives credit toward the DCP goals. For each level you complete, your VPE must submit a recognition request on Club Central. If you are a member of more than one club, you can determine which club will receive credit for each level you finish. You are responsible for communicating your request to the VPE of the club to which you would like to apply the credit. I am completing my path in printed materials. Who approves my Pathways education? Your vice president education (VPE) is responsible for approving your education whether you are working in printed materials or on Base Camp. When you are completing your path in printed materials, your vice president education can track and validate your project and level completions on Base Camp. Be sure to communicate with him or her each time you complete a project and again when you complete each level. When requesting level completion, let your vice president education know if you would like a printed copy of your certificate. He or she will be able to access your certificate of completion, which can be emailed to you or printed. If you do not have a vice president education, communicate with your president or secretary. I submitted a level completion request that has not been approved. What should I do? 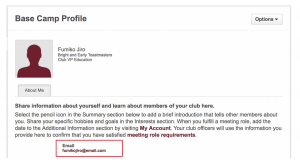 When you submit a level completion request or a request to complete an assignment outside of your club, an email is automatically sent to the address on file for your club. Your vice president education is responsible for monitoring and approving pending Base Camp requests. If your request is not approved within five days, communicate with your vice president education. If you do not have a vice president education, or if this officer is absent and unable to submit verifications and approvals, communicate with your president and then your secretary. Is the Base Camp manager a new club officer position? How do I know who my Base Camp manager is? No, this is not a new club officer position. The term Base Camp manager refers to the club officers who have access to approve education on Base Camp. In most cases, your Base Camp manager is your vice president education, as he or she is responsible for approving education in Pathways. If your club does not have a vice president education or if this officer is absent, then your president is responsible for completing Base Camp manager tasks. If your president is unable to submit approvals for any reason, the club secretary completes those tasks. Who verifies my education on Base Camp? Your vice president education (VPE) is responsible for verifying your Pathways education on Base Camp. When you submit a level completion request, your vice president education views your request and ensures that you have met all requirements for that level. Similarly, when you submit a request to complete an assignment outside your home club, your vice president education will view your request and ensure that it meets the requirements for your project. You may choose to fulfill a role at each level or complete multiple roles within a level. You determine when you serve in these roles. Remember, you fulfill the requirement of evaluator in the “Evaluation and Feedback” project at Level 1. 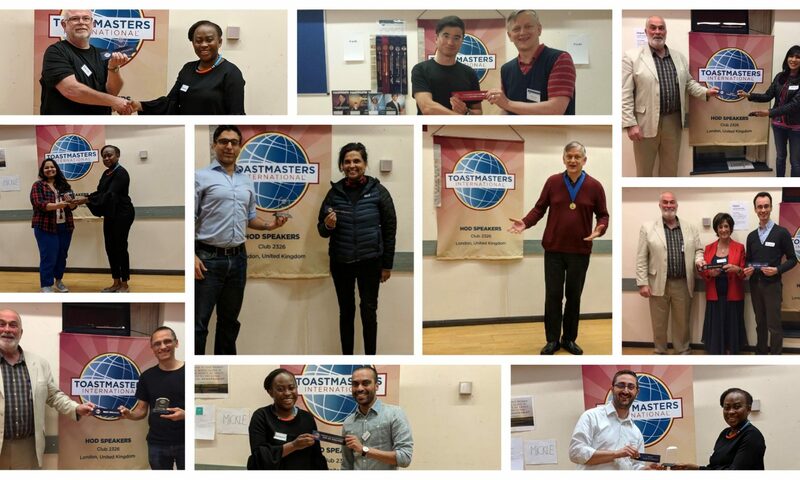 Some paths require you to serve in other meeting roles, such as Topicsmaster in the “Active Listening” project. Serving in a role as part of a project assignment counts toward the requirement described above. 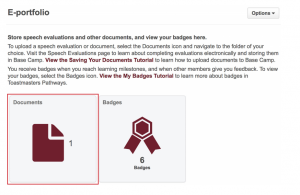 Keep track of your meeting role fulfillments on Base Camp to make it easy for your vice president education to approve that you completed Level 3. Other members can also view your profile to see which roles you completed. You can record only one date per meeting role on your Base Camp profile. Make sure to update all your meeting roles each time you serve. 1 Hover over the gear icon at the top right of your screen, then select My Account. 2 Find the box for the meeting role in which you served. 3 Select “Select a date” or the calendar icon. 4 Select the date you served in that meeting role. 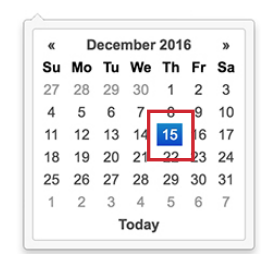 If you served in the role in a previous month, use the double arrows at the top of the box to find that month. 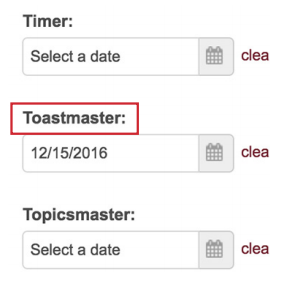 5 When you’ve finished adding your meeting role date(s), select Save at the bottom right of the page. 6 Your Base Camp profile will now show the updates you made to your meeting roles. Read these FAQs if you have questions about using and saving fillable PDFs and other resources on Base Camp. How can I save a completed evaluation resource or resource document on Base Camp? Save the completed document to your device. Select the E-portfolio tab in your Base Camp Profile. Select the folder in which you would like to store your document. 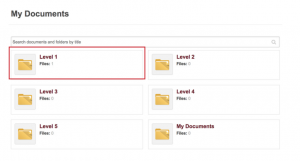 The My Documents page includes six folders, one for each level of your path and one for any other documents or other materials you would like to store on Base Camp. In the box that appears, select the Select a file button, locate the document you wish to upload and select Add. I can’t fit all my comments in the fillable PDF. ls there a way to add more comments? The fillable PDFs accept a limited amount of text. If you would like to share additional feedback with the member you are evaluating or need to include more text in a resource document, you can save a second version of that same document with the additional text or you can record the text in a separate document. I completed a fillable evaluation resource or resource document that I would like to share with another member of my club. Is there a best practice for sending resources? Yes. Make sure to save completed resources to your device. Changes you make in the document will not be automatically stored on Base Camp. Once you have saved a resource to your device, send it to other members of your club as an email attachment. If you are sending the document to a member of your home club, you can find their email address on their Base Camp Profile. Type the member’s name in the search box in the upper right corner. You can search using a member’s first name or last name, and only need to type three letters for a list of suggested names to show. Select the name of the member when it appears. Selecting the member’s name will open their Base Camp Profile page. The member’s email address will show near the top of this page. I opened a resource document or evaluation resource from the Tutorials and Resources page and noticed that I can type in the text boxes. How do I use these? The evaluation resources and many of the resource documents on the Tutorials and Resources page are fillable PDFs. This means you can complete the resource digitally, without printing it. When you select one of the boxes, a cursor appears. This allows you to type in that box. When you finish adding text to a box, you can move to another box to add text. To ensure your changes remain in the document, you must save the PDF to your device. As a best practice, save your changes when you complete each section. I opened an evaluation resource or resource document from inside my project and I am not able to add text to the boxes. How can I complete this resource? There are projects that include resources that are not fillable. For a full alphabetical list of fillable evaluation resources and resource documents, go to the Tutorials and Resources page. 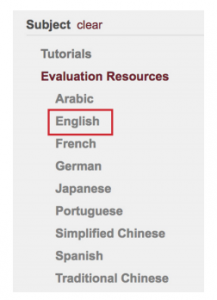 Under Subject on the left of the page, select the resource you need, then select your preferred language. (Resource documents and evaluation resources are available in several languages.) All fillable documents in the language you select will open to the right. Select the title of the resource you would like to complete, then select Launch. The PDF will open and the resource will be added to your Education Transcript. To ensure your text is saved, save the PDF to your device. I want to use the fillable evaluation resource during my club meeting, but our meeting location does not have internet access. Is there a way I can access this resource during my club meeting? 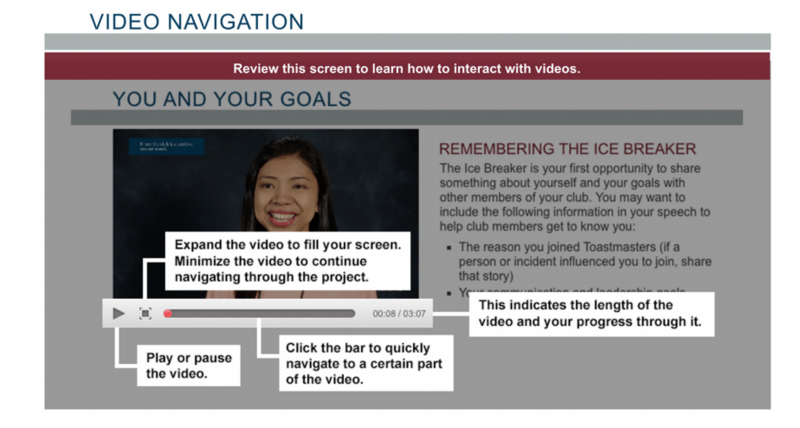 Prior to your club meeting, download the resource from the Tutorials and Resources page on Base Camp. Launch the evaluation resource from Tutorials and Resources using the steps outlined in the question above. Next, save the resource to your device. You can now open and type in this document without internet access. Be sure to save your changes so you can later email the document to the speaker when you are able to connect to the internet. My evaluator completed my evaluation resource on paper. How can I save it on Base Camp? If your evaluator completed a printed evaluation resource, you can still save the document on Base Camp. Option 1: Scan or take a picture of the evaluation form and save it to your device. 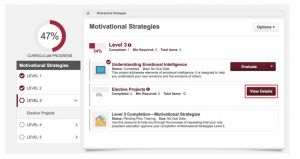 Option 2: Download the fillable evaluation resource from the Tutorials and Resources page. 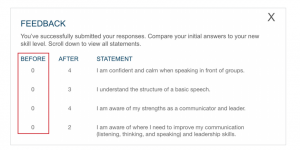 Type the feedback from your evaluator into the comments boxes and record the ratings she provided by selecting the appropriate score. Save the completed document to your device. Once you have saved a scan, photo or PDF of your evaluation, upload it to Base Camp and save it in the folders on the My Documents page, using the steps outlined above. When I open and fill out a resource document, are my responses saved on Base Camp after I close the document? No. To ensure your changes remain in the document, you must save the PDF to your device. As a best practice, save the PDF to your device before you begin typing. When saving a resource document to your computer, you may wish to add a date or other identifying information to the file name. Read these FAQs if you have questions as you access, view and complete projects and levels in your Education Transcript on Base Camp. How many electives do I need to complete in a level? 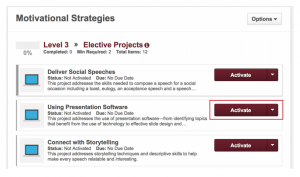 While you will have access to all of the electives at once, you can find the minimum number required to complete the level near the top of the Elective Projects overview page. I accidently moved my path to the Archived page. How can I get it back to my Education Transcript page? To move the path to your Education Transcript page, you need to mark it as Active from the Training Details page. To access the Training Details page, select the title of the path from the Archive page. From the Training Details page, you will see the option to Activate in the upper right corner. Click Activate to return your path to your Education Transcript. I am ready to complete my electives. How do I add them to my transcript? To access the complete electives list, select the View Details button from the Level Overview page. Next, click the Activate button for each elective you wish to complete, followed by the Launch button. This will allow you to work through your desired elective projects. 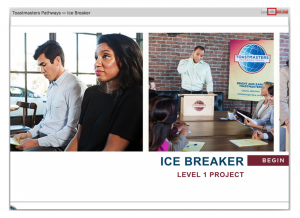 I am working on Level 1 and am only able to open the “Ice Breaker” project. Why can’t I open the other projects? In Level 1, as well as Level 5, there are required projects that must be completed first before you can begin working in the other projects. Once you have completed the required project in the level, such as the “Ice Breaker” in Level 1, you will be able to access the remaining projects. If I complete more than the minimum required number of electives, will I receive credit for the additional electives on my next path? While you may complete as many electives as you like, there is no extra credit or recognition given for completing more than the required number of electives. Additionally, credit for completing projects and electives does not carry over from one path to another. If you complete all electives in a level on one path, please keep in mind that you will see these electives again on your next path. If you decide to complete more than one path, or complete the same path more than once, you will need to complete the required number of projects and electives on the path each time you complete it. What happens if I mark complete a resource document or tutorial in my Education Transcript? Do I get credit for completing the tutorials and other resources? If you select the Mark Complete button from your Education Transcript, the item will move to the Completed page of your transcript. You do not receive credit for completing tutorials or resource documents. For more information on how to earn credit for recognition, please see The Navigator. Why is my path no longer in my Education Transcript? If you do not see your completed path on your Education Transcript page, it is likely that the path was moved to the Completed page of your transcript. This happens automatically when your vice president education approves your Level 5 completion request and the status of your path changes to complete. You can view the Completed page by selecting Completed from the Active dropdown menu. Please note: If your path does not appear on the Completed page, it may be on the Archived page. Read these FAQs if you have questions as you work through projects on Base Camp. 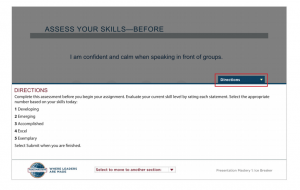 Am I required to use the Assess Your Skills tool at the beginning and end of my project? Yes. 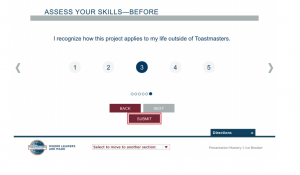 This tool not only shows you the progress you’ve made to improve your skills, but it also helps you prepare for your final speech in the “Reflect on Your Path” project. 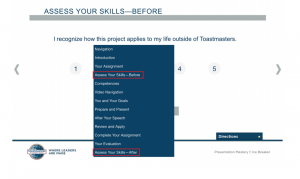 Make sure you complete both Assess Your Skills sections—the first one before you begin and the second after you complete the project. This way, you have an accurate reflection of how you may have improved over time. When you complete Assess Your Skills, be sure to rate yourself on every statement. Once you’ve done so, a Submit button will appear below the Back and Next buttons. You must select this button to ensure your responses are saved. How do I use the video screens? How do I zoom in/out the project window? Adjust the zoom of your window by changing the browser settings. Find the settings or tools section of your browser to make changes. I can’t see all the buttons on my screen. What do I do? Your internet browser window may be zoomed in, which can cut off some of the text and buttons. To resolve this issue, adjust the zoom of the window by changing the browser settings. I took the Assess Your Skills—After assessment and submitted my ratings. However, my results show a score of 0 in the before column. What happened? The results in the Before column show scores of 0 because you did not submit your Assess Your Skills—Before ratings. You must rate yourself on each statement and select the Submit button to ensure your ratings will be saved. If you do not select the Submit button, your answers will default to 0. I took the Assess Your Skills—After assessment but not the Assess Your Skills—Before assessment. Can I reset my answers to try again? For best results that show your progress, always complete the Assess Your Skills—Before assessment prior to beginning your project. I want to reference content from a completed project. Is it possible for me to view two projects at once? You can open only one project at a time. If you would like to review content from a previous project while working in your current project, please use the self-print PDF version of the completed project. Starting at the Level Overview page, launch the project that you would like to review. Once the project has opened, navigate to the Your Evaluation page using the dropdown section menu. Select the “Print My Project” text from the list of resources on the right. Please note: The PDF may open in a new browser tab or window depending on your browser and settings. You may want to save the PDF directly to your computer or other operating device for easy access in the future. My project doesn’t open after I launch it. What do I do? Your project may be open, but minimized or hidden behind another window. Check to see if there are any other browser windows open on the task bar, or minimize the window you currently see on your screen. Your pop-up blocker may be turned on. It must be turned off to view the projects, which open in a new window. To check that your pop-up blocker is off, check your browser settings. The directions tab opened automatically. How do I close it? To close it, simply click the Directions tab.